The refinery was using VJ couplings as the flexible connection between the storage tanks and the manifolds. As the seal of the VJ couplings has a rubber ring, which is compressed by longbolts, regular maintenance had to be carried out in order to prevent leakages These couplings demanded a considerable amount of attention from the maintenance crew, particularly in the warm summer months, with the constant risk of spills. The solution proposed to the refinery was the use of Tank Farm Bellows. This type of expansion joints look like standard lateral expansion joints, but are specifically designed for tank farm applications. 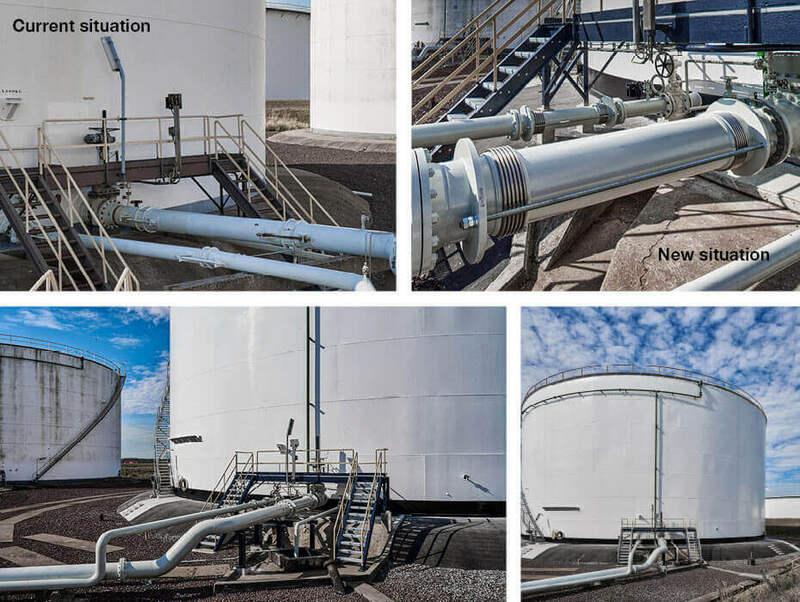 These particular Tank Farm Bellows provided the refinery with a reliable, flexible connection that could absorb the tank settlements with a minimal risk of unwanted spills during the entire service life time of the storage tank. The integrated inner sleeves design ensures that there is no disturbance to the flow of the medium which could negatively influence the time needed to fill or empty the storage tank. The bellows were made from Incoloy which gives a superb resistance against corrosion. The other expansion joint components are made from A105 and A106 Gr.B and coated with a special multi-layer coating system as per the customers’ requirements. The Tank Farm Bellows complied with PED/CE and were delivered with full documentation, user guide and fabrication book. The expansion joints could be installed as soon as they arrived on site as no further NDE tests were required. Our long reference list of customised expansion joints designed and manufactured for oil refineries and terminals is supported by all necessary approvals and accreditations. We are familiar with prevailing design codes such as PED, NORSOK, ASME, EJMA etc.